Being so into stationery you can become habituated to the beautiful...Last week we were lucky enough to play with some Lamy 2000 Titanium Ballpoint pens. There are only 5000 of these in existence with 4000 confined to the European market. It feels incredible, it's a 50g pen made of solid titanium and is a truly special item. I was wowed. Thanks to Notemaker for the privilege! But then, Scott here at Field Notes came in earlier in the week with a new Delfonics diary. These have only just arrived and after our nagging the guys at NoteMaker for more Delfonics we learned that it is in really short supply at the moment but more should be available next week. And more is what we need. This really is the most gorgeous diary I've seen. 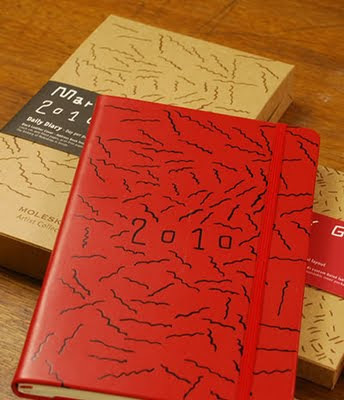 I like the Rhodia diary - it's clever and the paper is beautiful. 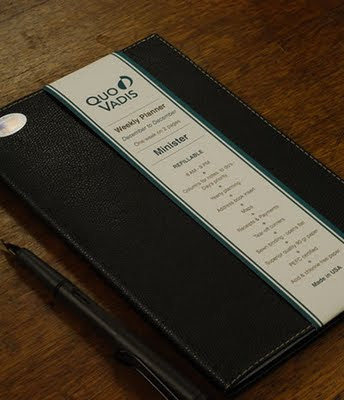 I like the Quo Vadis diary - Minister in particular - once again because the paper is so nice. I like a Moleskine diary too, especially the leather on the Artist Collection diary. But this Delfonics diary is on a whole other, higher, level. Pictures and words can't do it justice. Just go find one, hold it and get yourself a new best friend! And while you're at it, get a matching elastic strap and pen...stationery and fashion are now as one! I've just received my Delfonics Diary today and I'm so excited! It is exactly what I was looking for to replace my Shinzi Katoh Scheduler (I didn't like their redesign of the 2010 Scheduler.) The Delfonics is elegant, the paper is smooth and versatile for the different pens and inks I use and placing my order and the speed of delivery to the U.S. was amazing. Thank you for such great service and for introducing me to such a wonderful planner! I am so in love with the first one! I dont take a single journey outside my home without a petite notebook and a pen. News from the Field: New Moleskine Colours!